The Remote Power Manager RPM 1600 Client Expansion is the ultimate power nerve center for controlling multiple network devices and services. 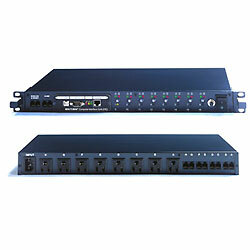 Individually control AC power for up to eight connected devices such as servers, hubs, routers, modems, and telephone systems. Up to 15 client RPM units can be added to control a total of 128 devices.